Mayo 1-7 Kerry 1-4 (James Stephens Park, Ballina, 11/3/1951). 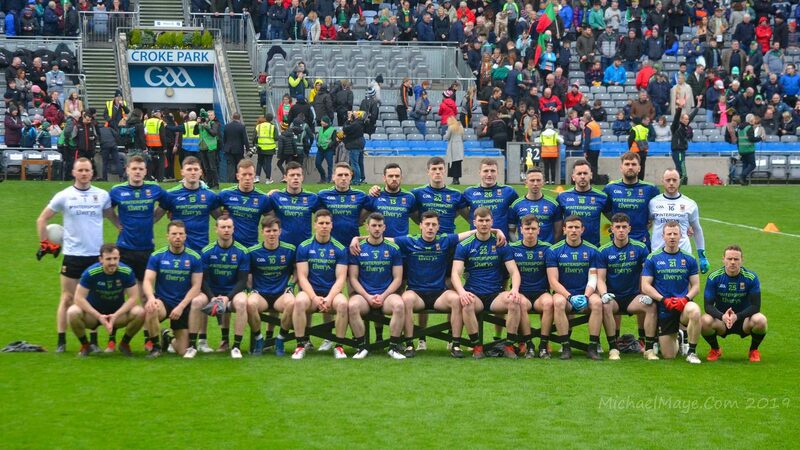 MAYO: S Wynne; P Doherty, P Prendergast, S Flanagan; J Forde, H Dixon, J McAndrew; P Carney (0-2), E Mongey (0-1); M Flanagan (1-1), P Irwin, J Gilvarry; M Mulderrig (0-1), S Mulderrig (0-1), P Solan (0-1). SEMI-FINAL: Mayo 1-6 Cork 0-2 (Croke Park, 8/4/1951). MAYO: S Wynne; J Forde, P Prendergast, S Flanagan; J Staunton, H Dixon, J McAndrew; P Irwin, E Mongey (0-1); M Flanagan, P Carney (0-2, frees), J Gilvarry; M Mulderrig (0-1), T Langan (1-1), P Solan (0-1, free). Sub: S Mulderrig for Carney. FINAL (HOME): Meath 0-6 Mayo 0-3 (Croke Park, 29/4/1951). MAYO: S Wynne; J Forde, P Prendergast, S Flanagan; J Staunton, H Dixon, J McAndrew; P Irwin, E Mongey; M Flanagan, S Mulderrig (0-1), J Gilvarry; M Mulderrig, T Langan, P Solan (0-2). SEMI-FINAL: Sligo 1-5 Mayo 3-7 (Corran Park, Ballymote, 24/6/1951). MAYO: J Thornton; J Forde, H Dixon, S Flanagan; P Doherty, J Staunton, C Hegarty; P Irwin, E Mongey; M Flanagan (0-2), S Mulderrig (2-2, one goal a penalty), J Gilvarry; M Mulderrig (0-2), T Langan (1-1), P Solan. FINAL: Galway 2-3 Mayo 4-13 (Tuam Stadium, 15/7/1951). MAYO: S Wynne; J Forde, P Prendergast, S Flanagan; J Staunton, H Dixon (0-1), P Quinn; E Mongey (0-1), P Irwin; M Flanagan, P Carney (0-3), S Mulderrig (0-3); M Mulderrig (0-1), T Langan (1-3), P Solan (3-1). SEMI-FINAL: Mayo 1-5 Kerry 1-5 (Croke Park, 12/8/1951). MAYO: S Wynne; J Forde, P Prendergast, S Flanagan; J Staunton, H Dixon, P Quinlan; E Mongey, P Irwin (0-1); M Flanagan, P Carney, S Mulderrig (0-3, one free); M Mulderrig, T Langan (1-0), P Solan (0-1). SEMI-FINAL (REPLAY) Mayo 2-4 Kerry 1-5 (Croke Park, 9/9/1951). MAYO: S Wynne; J Forde, P Prendergast, S Flanagan; J Staunton, H Dixon, P Quinlan; E Mongey (0-1), J McAndrew; P Irwin, P Carney (0-1, free), S Mulderrig (0-1); M Flanagan (2-1), T Langan, P Solan. Sub: M Mulderrig for S Mulderrig. Kerry 3-4 Mayo 2-6 (Austin Stack Park, Tralee, 7/10/1951). MAYO: S Wynne; J Forde, W Casey, S Flanagan; J Deasy, J Staunton, T Jennings; M Loftus, P Irwin; L Hastings, P Jordan, S Mulderrig (1-1, one free); M Flanagan (1-0), T Langan (0-1), J Curran (0-3, two frees). Subs: P Solan (0-1) for Loftus, ? McCormack for Deasy, M O’Malley for Wynne. Mayo 5-6 Clare 1-0 (Charlestown, 21/10/1951). MAYO: M O’Malley; W Casey, P Prendergast, S Flanagan; J Staunton, J McAndrew, F Fleming; M Loftus, P Jordan; P Solan (0-1), P Irwin (1-1), S Mulderrig (0-2); M Flanagan (2-0), T Langan (2-2), L Hastings. Subs: J McCormack, B Sheehan, T Jennings. Cork 0-6 Mayo 2-4 (Athletic Grounds, Cork, 4/11/1951). MAYO: S Wynne; J Forde, P Prendergast, S Flanagan; J Staunton, J McCormack, W Casey; P Jordan, P Carney (1-3, one free, goal from ‘50’); P Solan (0-1), P Irwin, B Sheehan (1-0); M Flanagan, L Hastings, M O’Malley. Subs: T Langan, M Deasy, F Fleming, J McAndrew. FIRST ROUND: Sligo 1-4 Mayo 0-5 (Corran Park, Ballymote, 24/6/1951). MAYO: M Lynn; J Mulligan, F Egan, M Shannon; S Doherty, A Jordan, P Flanagan; R Cavanagh, J Doherty; J Nallen (0-4), P O’Donnell, F Corry; V Sweeney, M O’Connell, F Noone. Sub: S Honan (0-1).